Welcome to Issue 2 of The Edge of Service, a conversation on the organizations, people and technologies redefining service delivery. You are receiving this new newsletter as a friend or colleague, or because we've connected or interacted on service topics. If you choose, you can unsubscribe by clicking unsubscribe. I recently delivered an address for an executive-level planning conference at a California-based health provider. A team within the organization had been working hard on a new suite of mobile-based health management tools—very cool apps. But they were developed and launched with little involvement from other parts of the service operation, e.g., the customer contact center (different divisions, separate teams). The results were predictable: unforeseen service misses and gaps. As many have learned first-hand, mobile apps, self-service capabilities, and services through social channels impact virtually all other types of customer interactions, including traffic patterns, handling times, the nature and demands of existing contacts (e.g., agents become de facto tech support for Web and mobile services) and customer expectations. To reach their potential, the efforts must be inclusive and they must be managed across the broader organization. I'm currently working on some particularly interesting and diverse projects—service restructures for companies in Philadelphia and San Francisco, some fascinating research and related tools around instilling ROI assumptions and calculations in service settings, and others. In each case, organization and culture is THE critical enabler. Little did I know how much inspiration would come from a 100-year-old ship. I hope the few minutes it takes to read this issue will be fun and informative. P.S., Thank you to so many for the enthusiastic feedback on the first issue. I'm encouraged and grateful! 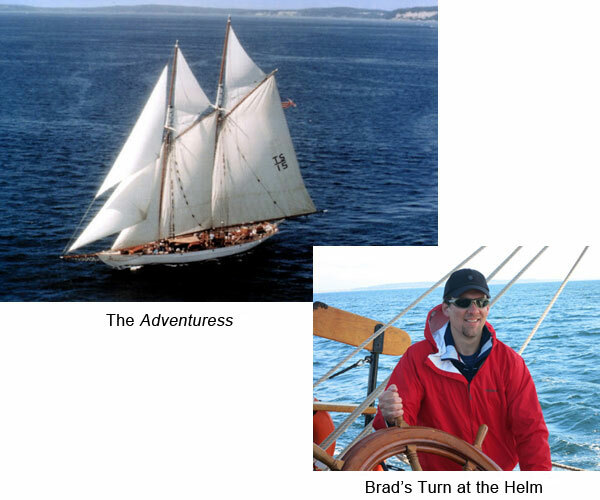 I recently was drawn out of a hat to be one of just a few parents to accompany my ten-year-old daughter's fifth-grade class on a week-long sailing trip—a school tradition dating back many years. The adventure takes place on a suitably named schooner, The Adventuress, based near Seattle. The Adventuress is a 133-foot-long narrow-hulled ship that boasts 5,478 square feet of sails. The ship was built in Maine in 1913 (yep, this is her 100th year!) and she has been part of whaling, two World Wars (serving as Coast Guard reconnaissance), and numerous research missions. You can imagine the stories that have accumulated. (One dark, stormy night in the 1960s, the ship and her passengers just about perished. A massive tree trunk carried by a 15-foot wave ripped into the bow and lodged like an arrow, tearing a larger hole with every up and down pitch. Facing sure destruction, the young passengers—a Girl Scout troupe studying forestry in the region—formed a human chain to the bow and used a chainsaw to successfully remove the tree.) Each evening, our captain, along with others among our colorful crew of 13, recounted these and other tales. I'm told they are mostly true—though I suspect they marinate some over time. Mission. Our captain and crew were crystal-clear on where we were going and how to make the most of the journey along the way. When service organizations have that kind of clarity and focus—think USAA, FedEx or Zappos—they accomplish amazing results. Competence. There are a jillion variables on a ship like this, and as well as roles can be defined, it's essential for everyone to have an understanding of how their actions impact everything else. When did so many of today's organizations conclude that design, production, marketing, or service can happen in relative isolation? When did we become deluded into thinking today's environment is more complex, sophisticated or fast-moving? When did that become an out for so often avoiding the kind of robust training and collaboration great results demand? Communication. Setting sails or changing course on a tall ship rivals the most complex processes in today's multichannel service operation. I always thought sea shanties (songs with interesting rhymes) were for entertainment to pass the time ("Cape Cod girls they have no combs, heave away, haul away! They comb their hair with codfish bones, and we're bound for South Australia!") The real purpose? To keep dozens of people and tasks in perfect sync. Brilliant! All before instant messaging. Passion. It's one of the most overused words in the business world, but wow, was it evident in our crew—and eventually, in the rest of us. Fun, adventure, accomplishment, the pure joy of being part of something worthwhile. These things are contagious (as are debilitating traits in the wrong kind of setting). This amazing group of kids—they captured my heart with their humor, talent, and perspective—became part of a self-perpetuating culture of support, accomplishment, and camaraderie. It was really awesome to see. There's something we've lost in many of today's organizations and institutions. But it can be regained. I'm surprised by and grateful to a 100-year-old ship and her crew for reminding me. Issue 1, The Edge of Service: Is Russia a Service Bellwether? Podcast: Will Social Communities and Mobile Apps Replace Contact Centers? 25% of companies feel their customers are extremely engaged with their brand. 93% of customers would be MORE satisfied with customer service if they were offered their channel choice. Mobile is considered a necessary channel by 72% of customers, and 90% find the features of social customer service somewhat or extremely useful. According to ICMI Content Director and report author Sarah Stealey Reed, the research shows that "if planned out and implemented correctly, the emerging channels can improve the efficiency of support operations, greatly increase customer satisfaction, and generate a renewed sense of customer engagement and loyalty to the brand." Source: ICMI 2013 report, Extreme Engagement in the Multichannel Contact Center. Mission: Does yours align decisions and priorities? Is it interesting and compelling enough to win the best efforts of your employees? Competence: Are there ongoing skills deficiencies or gaps in collaboration? Where are they? What would it take to resolve them? What would the investment and return in time and other resources be? Communication: Too much? Too little? The right technologies and channels? Passion: How would you characterize your culture in terms of support, accomplishment, and camaraderie? What three actions by leadership would most improve your culture? W Mitchell, next to whom I was privileged to sit (thanks to mutual friend George Walther) when he won a National Speaker Association (NSA) Hall of Fame award. He's the cover story in the April 2013 issue of Speaker, the NSA's official magazine. Mitchell suffered two devastating accidents, and he inspires so many with his message that unexpected change can become an exciting new starting point. Thanks for all you do, Mitchell. Gerry Barber, a longtime friend and industry colleague who won this year's ICMI Lifetime Achievement Award. Gerry is director of the call center at Deloitte Services, and he's been instrumental in advancing the art and profession of customer interaction for many years. Well-deserved and congrats, Gerry! I will be keynote speaker for APCCAL Expo in Korea (Seoul, November 6 – 9). Organized this year by Professor KJ Cheong, the event will bring together leaders from throughout the region (Korea, Japan, Hong Kong, mainland China, Thailand, Taiwan, Malaysia, Indonesia, Singapore, New Zealand, Australia). APCCAL rotates among participating countries and is the largest gathering of contact center leaders in Asia. Those interested in sponsoring and participating can contact Jane Seo at [email protected].